With the trip to Kanazawa we left the densely populated pacific coast of the japanese main island Honshu heading towards the Sea of Japan. Kanazawa is the smallest city on our trip so far. We arrived in the Ryokan (traditional japanese style guest house) late in the evening. We were pleasantly surprised by the size of our Tatami-room. 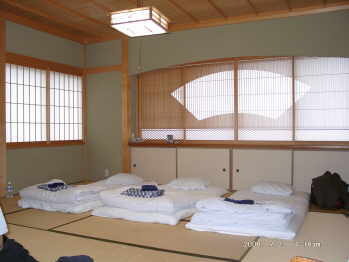 The size of traditional japanese style rooms is measured in Tatami mats (some 2 x 1 yards). Our room has the size of 19 mats ! When we arrived fresh tea was served and the futon beds had also been already made. So everything was ready for us to get out our notebook and start doing the report for you. In the morning we had planned to visit the much reclaimed Kenroku-en gardens at sunrise in its full beauty. 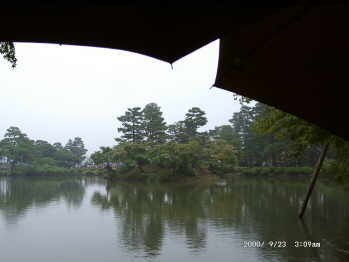 As you can see on the photo (umbrellas !) this plan unfortunately didn`t work out at all. A positive side-effect though was the fact that temperatures dropped below 85 degrees F for the first time during our trip so far. 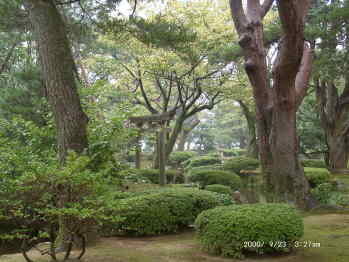 The Kenroku-en park supposably belongs to the most beautiful japanese gardens. It is definitely very nice and well maintained. For nature loving westerners however the precision and artificial tidyness of this kind of parks might be a bit disturbing. Whereas the West proclaims the `back to nature` movement, the japanese landscape gardeners define and enforce precisely how big nature has to grow and what shape each and every plant should have. We had the feeling as if no fallen leaf would remain on the ground for more than two hours before one of the caring workers would dispose it elsewhere. 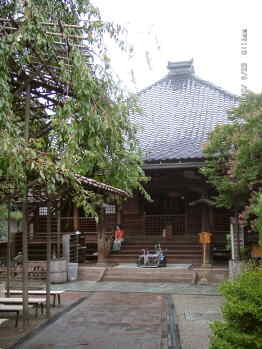 Then pure curiosity led us to the `Myoryuji-temple` also known as `Ninja-Dera`. We had to make reservations an hour in advance by phone - even increasing the suspense. Finally we arrived, our names were checked on the guest list and upon verification we were granted access to the main hall. The ever present `take-off-your shoes` ritual starts to get annoying and makes us think about wearing slippers next times. Now we know why so many Japanese wear slippers in daily life. Lots of rules greeted us when we entered the temple. No photos, no talking, careful walking and respectful behavior, please ! Finally we kneed down in front of the altar. Now a voice explained in details (but in japanese) the history of the temple. After this appr. 5 min. long presentation the tour started. Is was then that they told us that we would not see a Ninja fighting presentation. The name Ninja came to be associated with this temple only because the monks had created a very impressive maze of walkways, staircases and traps. At the time temples were only allowed to have 2 stories. Higher buildings were a privilege of the Shogun. The clever monks made their temple appear to follow this rule but inside there were 7 floors ! This temple really impressed us. The `Oohs` and Aahs` wouldn`t stop. 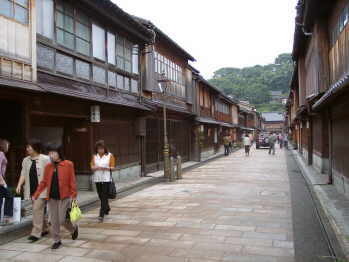 A definite `must visit` when in Kanazawa, even without a Ninja show. For 500 Yen we bought the day pass for the local bus which allowed us to get a good overview of the city during the 45 minute round trip. 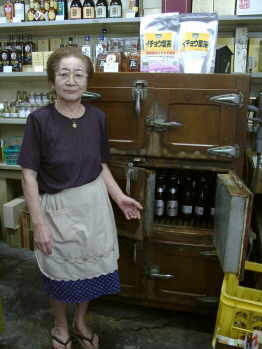 In this part of the city many very old shops can be found, one of them being this sake-shop of Ms Akiyama. Our attention was drawn to the large wooden chest in the center of her shop. It turned out to be an almost 50 year old fridge. We were very astonished to learn that it is still used for cooling beer today. 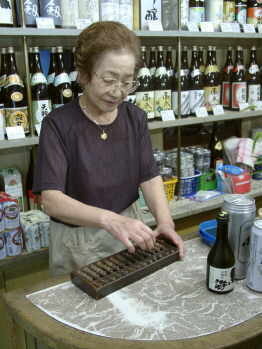 Ms Akiyama also uses a wooden abacus in her daily business. Adding up our purchases went almost as fast as the bar code reading in German supermarkets. 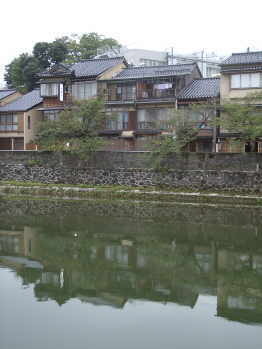 Overall we really enjoyed our stay in Kanazawa greatly due to the hospitality and big support we received from Satomi. We are looking forward to her visit in Hamburg in December. 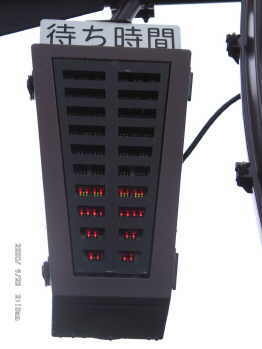 3) What is the object on the photo ?